If you've never heard of the Polish Boy Sandwich, you probably aren't from Cleveland. This beloved regional specialty can be found in diners and restaurants all across the city and is a taste like no other. Regional Foods are those foods that you find in your hometown but in no other place around the world. Foods like this City Chicken (that's not really made from chicken at all!) The foods that you've grown up eating and loving. For me, this Polish Boy Sandwich IS Cleveland. You won't find this delicacy in any other part of the country! 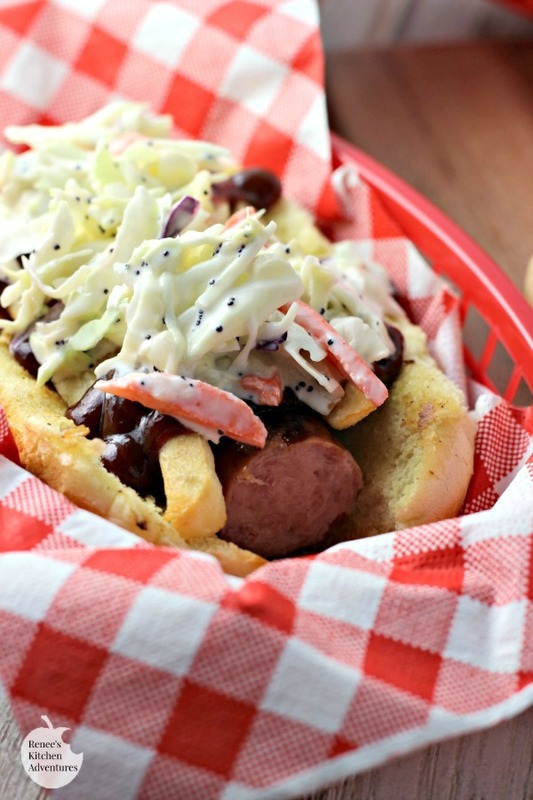 My version of the Polish Boy Sandwich starts with grilled kielbasa nestled in a toasted bun. Then I top it with with BBQ sauce, golden french fries and coleslaw. It's a very messy sandwich, but it's very much worth the mess! Just make sure you have a few extra napkins on hand! Growing up in Northeast Ohio, I ate many foods with Eastern European influence. Foods like pierogi, packzi, and kielbasa. Most holiday meals here have either pierogi, kielbasa, or both on the menu. Kielbasa is a go-to meal in these parts, because paired with some kraut, it makes a hearty meal! You will find many vendors in the historic Westside Market selling their version of the best kielbasa. You don't have to go very far to find this tasty sausage in Cleveland. Kielbasa takes center-stage in this sandwich. I have to admit, although I always knew what a Polish Boy was, I had never actually tried one before I made this sandwich. Boy was I missing out! The combination sounds odd, but put together, it somehow works out beautifully! There doesn't seem to be very many rules when making this sandwich. 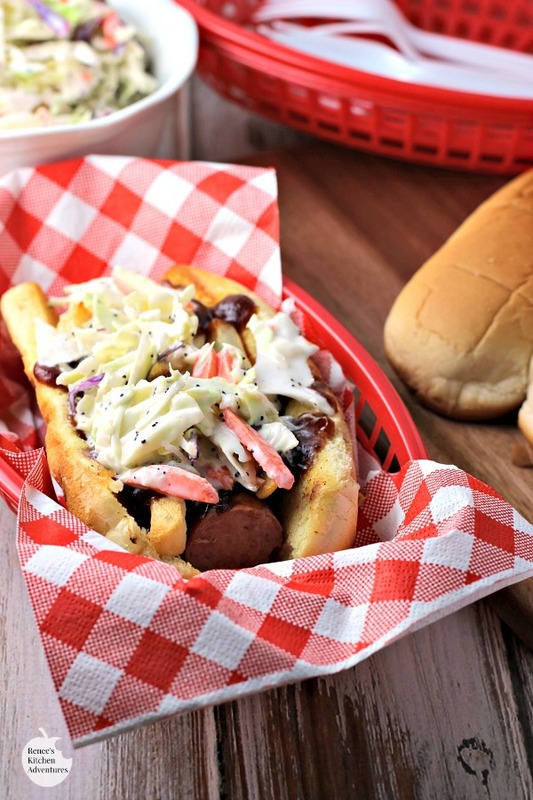 Use your favorite bun (I used a hot dog bun) and your favorite Kielbasa sausage (I used turkey kielbasa) top it with your favorite BBQ sauce, some fries (I used frozen oven baked for convenience) and finish it with slaw. That's it! Make sure you keep a stack of napkins handy though...you will need them! Have you ever eaten a Polish Boy Sandwich? An easy, make at home version, of the iconic Cleveland delicacy, The Polish Boy Sandwich. Heat skillet over med-high heat. Add 1/2 TBS oil and heat until it just starts to shimmer. Cook kielbasa in oil turning frequently until heated through. Place each link in a toasted bun. Equally divide BBQ sauce and place on top of kielbasa followed by fries (see NOTE) and then slaw. Serve immediately. You may need a fork and you will definitely need lots of napkins! Prep Time: 00 hrs. 05 mins. NOTE: You don't need to use all the fries in the sandwich. Put a few on the sausages and serve the rest alongside the sandwich for a complete meal. Like what you see? Follow RKA on all these social networks!! Can you believe I've known about them all my life but never tried one until now? haha Hope you enjoy it! When I first moved to Cleveland, I asked what is Cleveland known for food wise, and I was told "I think it is 'Po Boys or Polish Boys" When I asked what was the difference, they said nothing just on how you pronounce it. :) Great recipe! I could totally gobble one of these bad boys up in a minute! Perfect for baseball season! Yes! Perfect for baseballs season! Kristen, I had forgotten you are from CLE. I agree on time spent at the Westside Market. Did you know they are open on Sundays now? I would definitely eat one of your Polish Boys, Renee! What a great combination of toppings and I'll always take a kielbasa over a regular hot dog in a bun. Oh yum! I need to get one next time I'm in Cleveland. Living in Pittsburgh we eat a lot of pierogies and kielbasa but I've never had one of these! I see these for dinner soon!! Looks delicious. Sounds darn good to me, Renee! Even to my Buckeye state husband (from Athens, OH)! Mmmmm! That reminds me a bit of a Primanti's sandwich here in Pittsburgh. They have sandwiches with Italian sausage, fries, coleslaw and tomato. However this is also very different. 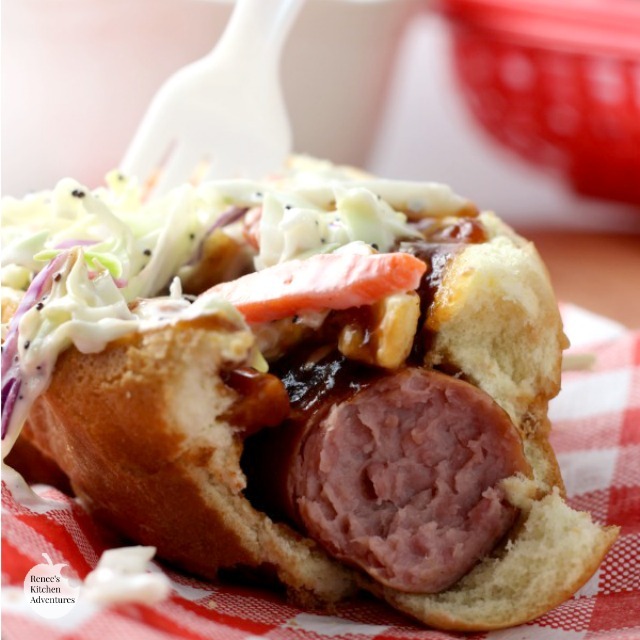 I love,love, love kielbasa and all the toppings so the combination just sounds wonderful to me. I can't believe I've never heard of them. I'm making one this week! YUM! The cole slaw makes it healthy, right? This would make such a nice lunch! I like the slaw on these for some crunch! This looks yummy Renee! I love dogs with toppings like this! Thank you so much for sharing this sandwich recipe. It's a MUST for me to try. I love everything about it. Messy eating and all. You're right, hadn't heard of it but I'd love to try it now I see your pictures! I am definitely saving this recipe. I'd never heard of this sandwich being from FL, but I am of Polish decent so you know the Kielbasa is calling my name. And, um, French Fries are kind of my downfall. Thanks so much for sharing! I have a Polish Deli here in Las Vegas, and it beats the markets kielbasa.. um um good!!!! By my last name I am of Polish decent also, and watching the Pope in Krakow, Poland. My Grandparents (both sides) immigrated from Warsaw during the Nazi War. The only think different I would do is grill the kielbasa instead of frying in all that oil. Just a suggestion..
Grilling would work great too!